With sincerity and hard work of our team, we have established a strong foothold in the industry by offering Cool Hungama Water Bottles. 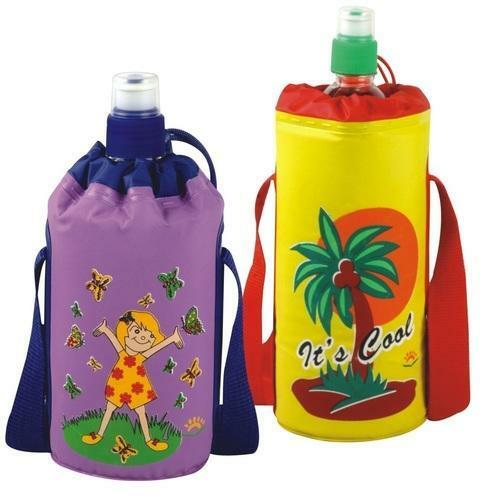 Offered water bottle covers are made using best grade raw material, sourced from trusted vendors. Further, to ensure their fine finishing, we take aid of modern machinery in their designing. Sai Home Appliances, an eminent organization engaged in manufacturing, exporting a comprehensive array of Lunch Boxes, Kitchenware and Water Bottles since 1990. Under the offered range, we provide Economy Lunch Boxes, Kids Lunch Box, Insulated Lunch Box, Thermal Lunch Boxes and Triple Decker Lunch Boxes. In addition to this, we provide Tiffin Boxes Traveling Set, Steel Tiffins, Hot Food Carrier, Stainless Steel Lunch Box, Stainless Steel Lunch Boxes and Round Bottom Top Cookware Set. The demand of offered kitchenware and lunch boxes is high as these are manufactured by making use of the best quality raw material that is sourced from the most trusted vendors of the industry. Moreover, we design these kitchenware, lunch boxes and bottles as per the prevailing trends of the market. Our patrons can avail from us offered kitchenware, lunch boxes and bottles in varied colors, designs, sizes and patterns as per their requirements. We have hired professionals who gauge the requirements of patrons and by taking aid of modern machinery provide them with these kitchenware, lunch boxes and bottles as per their given details. These professionals ensure that all the processes at our spacious infrastructure are carried out in a smooth manner. For the same, they maintain work balance while working in the varied units of our infrastructure. We are huge clientele all across East Asia, Middle East & Indian Subcontinent.